I’ve got a fever and the only prescription is more Deadpool. This is only one of a myriad of Deadpool T-shirts out there in the wild, but it’s one of my favorites because I love the relationship between Deadpool and Spider-Man. They can mess with each other in ways that only superheroes can mess with each other. 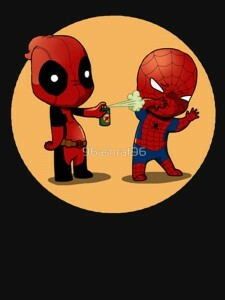 And when I say “they can mess with each other” I mean “Deadpool can mess with Spider-Man and totally annoy him.” Look at him spraying bug spray on the webslinger. Classic! Go see Deadpool or read a Deadpool comic or something. You’ll fall in love just like he’s fallen in love with Peter Parker.